In the last few days, ice coverage on Western Hudson Bay finally dropped below the 30% level that now defines ‘breakup’ for polar bears: a few bears near Churchill started to come ashore late last week but most will stay on the ice until the end of July. That means breakup this year was unofficially July 8th, a week later than average (July 1) for the third year in a row. Don’t’ tell that to the folks at Polar Bears International, though, because they’re busy telling people that the ice-free season for Western Hudson Bay bears is now longer than it was before the 1990s. What they mean is that the overall trend is toward early breakup dates. But what they don’t admit is that over the last 44 years, breakup was a full two weeks earlier than average for Western Hudson Bay only six times and only three of those early breakups occurred within the last 13 years. See the calculations below and see what you think. 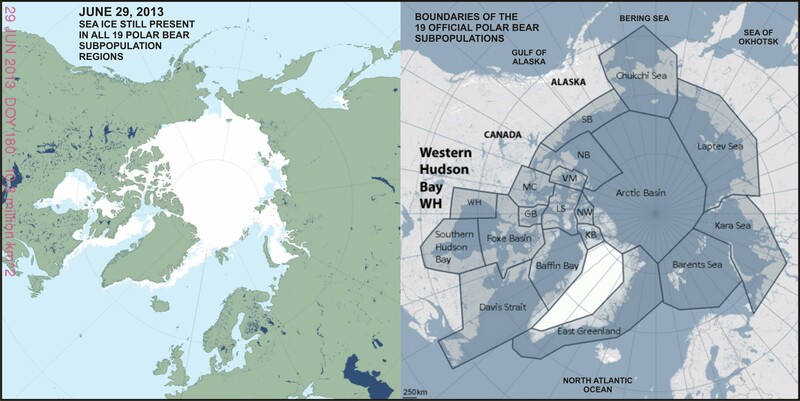 This is a follow-up to an earlier post, Polar bear problems in N Hudson Bay not due to late freeze-up, to counter some misinformation that’s being circulated about the history of Hudson Bay freeze-up dates. Polar bear biologists working in Western Hudson Bay published new definitions of breakup and freeze-up earlier this year. The new method better reflects how polar bears interact with seasonal changes in sea ice on the bay. Formerly, 50% ice coverage levels were used to assign the date when major ice change phenomena were reached each year (breakup in summer, freeze-up in fall (e.g. Gagnon and Gough 2005). The new method (Cherry et al. 2013, see discussion here) defines breakup at 30% ice coverage and freeze-up at 10%. 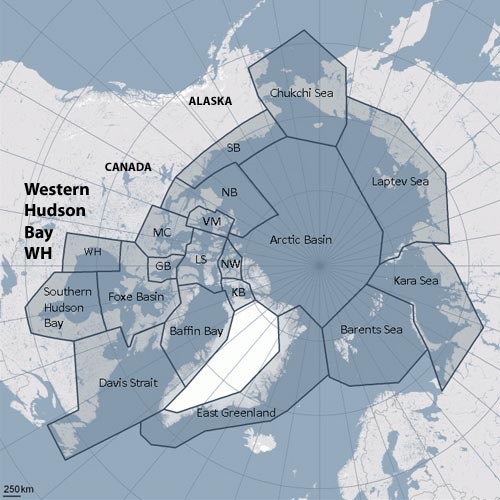 Cherry and colleagues had a fairly complicated method of defining 30% coverage for breakup in Western Hudson Bay. However, freeze-up in the fall is much simpler because ice always forms first along the western shore, starting in the north. This means that the weekly graphs of ice development provided by the Canadian Ice Service for Hudson Bay, which are expressed as a percentage (just like the Cherry et al. study), can be used to compare freeze-up dates historically. These graphs refute the absurd claim that freeze-up on Hudson Bay has been “one day later each year” over the last 30 years – an assertion repeated just the other day at PBI. Let’s take a closer look, shall we? 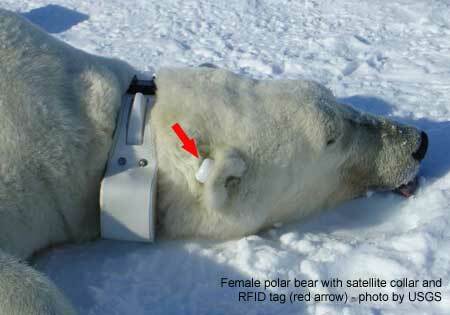 This is a quick follow up on my last post (here) on Kaktovik polar bears of the Southern Beaufort Sea subpopulation. 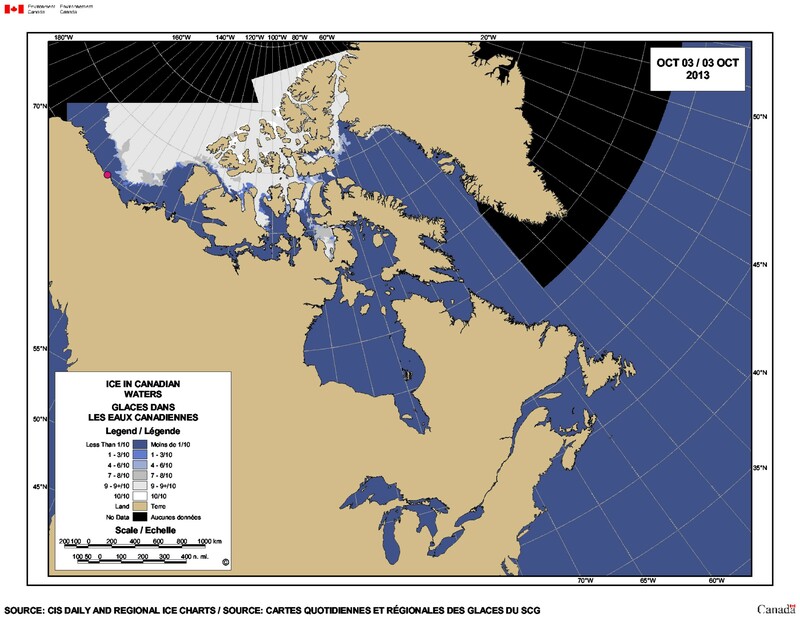 Kaktovik is the bright pink dot on the ice map below (October 3, 2013: click to enlarge), from the Canadian Ice Service – if the ice doesn’t get to the polar bears waiting on shore this weekend, it will be within swimming distance. Note that this map doesn’t show the shorefast ice that is already forming along the beaches, bridging the gap between land and the offshore ice. Shorefast ice provides the fall’s first ice platform for polar bears to hunt seals. It doesn’t need to be extensive for the bears to get out there — researchers working in Western Hudson Bay found that an ice concentration of only 10% marked the point when polar bears left the shore. Posted on July 28, 2013 | Comments Off on Baffin Bay-Davis Strait ice concentration comparison – why use the “summer mean”? I’ve been in the process of looking at the status of polar bears in the Baffin Bay region, which lies to the north of Davis Strait (Fig. 1), but a related issue caught my attention that I think deserves discussion. Figure 1. Polar bear subpopulations defined by the Polar Bear Specialist Group (PBSG). Note that Baffin Bay, Davis Strait, Western Hudson Bay and Southern Hudson Bay are all similar in that they become ice-free by early fall (the September minimum) or even before. Something similar struck me about the analysis of sea ice in Baffin Bay and Davis Strait conducted by polar bear researchers Karyn Rode and colleagues (Rode et al. 2012). In their comparison of body condition (relative fatness) of bears in Davis Strait and Baffin Bay (see previous post here), they introduced an entirely new sea ice metric – “mean daily summer sea ice concentration,” defined as the mean of values between May 15 and October 15 each year based on ice charts provided by the Canadian Ice Service. Why invent a metric that has never been used (as far as I know) for analysis of polar bear health, survival or success? Why not use breakup dates, as has been done for decades for subpopulations in Hudson Bay (e.g. Cherry et al. 2013), where the ice also disappears in late summer? Is there something in the ice data for Baffin Bay and Davis Strait that Rode and colleagues don’t want us to see? Since I had already made a composite of Cryosphere Today ice maps at July 12 for my discussion of the Chukchi/Beaufort NSIDC analysis mentioned above, it was relatively easy to look at what was going on in Baffin Bay and Davis Strait on that date in mid-summer. Keep in mind that ice extent and concentration at July 12 records the state of polar bear habitat prior to the late summer decline in sea ice that occurs every year. Comments Off on Baffin Bay-Davis Strait ice concentration comparison – why use the “summer mean”? The sea ice chart provided by the Canadian Ice Service (Fig. 1 below) shows a lot of ice still present in Hudson Bay today, the last day of June, 2013. Figure 1. Sea ice extent in Canada, June 30, 2013. From the Canadian Ice Service. This means we have long passed the point when breakup of the sea ice in Western Hudson Bay (30% ice concentration) could be considered ‘early.’ See Table 1 below for previous breakup dates (1991-2009) and previous post here for more details. Table 1. Breakup dates calculated for Western Hudson Bay, 1991-2009, using the new method described by Cherry et al. (2013, in press). More details in previous post here. Since most polar bears don’t leave the ice until almost a month after the official breakup date is declared, it means that even if breakup for Western Hudson Bay occurs within the next few days, most polar bears would not start their summer fast until the beginning of August. Regardless of when polar bear biologists decide that breakup has occurred, one thing is now clear — this will not be an early breakup year for Western Hudson Bay. That’s good news for polar bears. And what about the rest of the Arctic? You’ll see from Fig. 2 below that as of yesterday (June 29), there was still ice present in each of the 19 polar bear subpopulation regions — more good news for polar bears. It’s like pulling teeth, getting up-to-date information on breakup dates of Hudson Bay sea ice. You’d think with the importance of this seasonal event to the polar bears of Hudson Bay (some of which, we’re told, face the most perilous future of all polar bears worldwide), we’d get a press release every summer alerting us to the precise date of sea ice breakup and the subsequent arrival of the bears onshore. I’m thinking of something similar to the dispatches we get from the National Snow and Ice Data Center (NSIDC) when Arctic sea ice reaches its yearly maximum (e.g. March 2012) and its yearly minimum extent (e.g. September 2012). So I was intrigued to see that a new paper just out in the Journal of Animal Ecology, by Seth Cherry (a Ph.D. student of Andrew Derocher) and colleagues, dealt with Hudson Bay breakup dates. I was hoping for some data beyond 2007, which has been the limit of information provided so far by polar bear biologists (see previous posts here and here). Unfortunately, because the methods for determining breakup dates in this paper are so different from previous ones (more detail below), the new data (1991-2009) can’t be compared to earlier studies that go back to 1979. But there is some good news. Although you wouldn’t know it by the author’s conclusion, the results of the study confirm for this region my previously stated contention that polar bears need spring and early summer ice (March through June) for gorging on young, fat seals and documented declines in sea ice have rarely impinged on that critical feeding period – by which I meant, bears have seldom, if ever, been forced off the ice of Hudson Bay as early as June. The study also confirms that there has not been any kind of spectacular retreat of sea ice breakup dates – coming earlier and earlier in the season – over the last 19 years and that polar bears did not arrive on shore in 2009 until very late – approximately 22 August – the same date they came ashore in 1992. Below are two figures from the paper: one (the map) necessary to understand the new “Cherry method” of calculating breakup dates for Hudson Bay (no disrespect intended) and the other (the graph), which presents the data collected. The table with my converted breakup dates is below them. A few quotes from the study and some comments on it follows. UPDATE (March 21 2013; 6:12 PM PST). 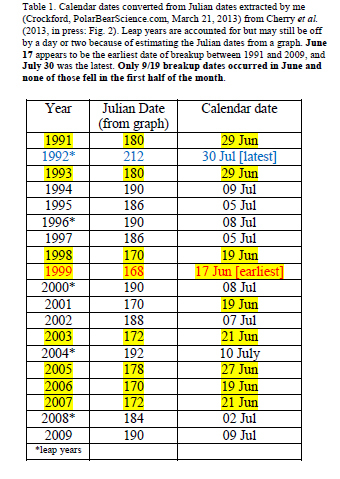 A typo in the table has been fixed (2001 is Jun 21 not Jul 21) and the post amended accordingly. UPDATE 2 (July 7, 2013) The Cherry et al. paper is now in print, the references have been updated accordingly.